President Obama speaks at Cedar Falls Utilities in Cedar Falls, Iowa, on Wednesday. He encouraged the Federal Communications Commission to pre-empt state laws that stifle competition for high-speed Internet service. President Obama is expected to lay out plans today intended to make it easier for cities, towns and rural communities to offer their citizens fast and cheap broadband Internet. The move would ask the Federal Communications Commission to address state laws that prevent cities from building their own municipal Internet services. But it's likely to anger major cable and Internet companies. Obama announced his plans in Cedar Falls, Iowa, which is home to a 1 GB broadband network — 100 times faster than the national average. "Today, high-speed broadband is not a luxury," he said at Cedar Falls Utilities. "It's a necessity." He said greater access to faster Internet will make the U.S. more competitive globally. "There are real-world consequences to this, and it makes us less economically competitive," the president said in a video released before his remarks today. 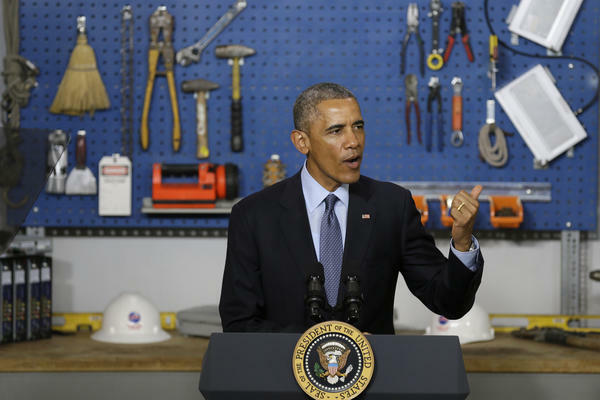 Obama's message is likely to resonate with Iowa Gov. Terry Branstad, a Republican, who has been pushing for access to broadband because his state has rural communities with no access to the Internet. "It's become a pattern that he goes to a state where there's a Republican governor that's doing something that he'd like to replicate on a national level," NPR's Mara Liasson tells our Newscast unit. Nineteen states have laws that prevent their cities' from building their own broadband networks. Supporters of those laws say they protect taxpayers. Obama's plans would include technical know-how and financial assistance to those towns, cities and rural communities that want to improve Internet service for their residents. "I believe that a community has the right to make its own choice and to provide its own broadband if it wants to. ... And if there are state laws in place that prohibit or restrict these community-based efforts, all of us, including the FCC, which is responsible for regulating this area, should do everything we can to push back on those old laws," Obama said today in Cedar Falls. The plan is likely to be opposed by companies such as Comcast and Verizon, which provide Internet services around the nation. Obama's support for net neutrality and an open Internet have already angered these firms because the president wants the Internet reclassified as a public utility. Broadband for America, a group whose members include major Internet service providers, said while it strongly agrees Obama's plan to expand broadband access, the president "is risking the success we have witnessed by advocating for the reclassification of broadband as a Title II public utility — unprecedented government interference that would stifle private investment, hinder innovation and undermine the growth of the Internet." Chattanooga, Tenn. — Chattanooga's publicly owned electric company has already built a municipal broadband network in the city. — and Wilson, N.C., have asked the FCC to intervene against state laws that limit publicly funded Internet. "I believe that it is in the best interests of consumers and competition that the FCC exercises its power to preempt state laws that ban or restrict competition from community broadband," FCC Chairman Tom Wheeler wrote in a blog post last year. "Given the opportunity, we will do so." But it's unclear if the agency has the legal authority to do that. NPr's Joel Rose has previously reported on how some cities are taking high-speed Internet into their own hands.